While Starbucks announced Monday its plans to end the use of straws, two Ottawa businesses are far ahead in bidding farewell to the small plastic pipes, which environmentalists say harm oceans. Happy Goat Coffee Company and Thyme & Again Creative Catering decided to ditch plastic straws in order to cut back on plastic waste. "It's just a convenience. They see it, they use it," said Henry Assad, the owner of Happy Goat Coffee. "We have to go through the hard times [of] explaining to people that we don't carry it." At Happy Goat Coffee, straws are only available to those who need them, including young children and people with disabilities, Assad said. Even those straws, he said, will soon be replaced with paper versions. Starbucks is the latest corporate chain promising to ditch plastic straws because of the environmental threat to oceans. It's joining other corporations like A&W, Ikea Canada and the group that owns Swiss Chalet and Harvey's. Within two years, the coffee chain says it will only use straws made from biodegradable materials like paper. It also plans to serve more of its drinks in cups with specially designed lids, which don't need straws. Starbucks is one of the largest food and beverage companies to join the movement. "It's very important not only on the businesses and corporations but also on the public's side of things," Assad said. "We should all be a little more aware of our surroundings, our environment.... There is no reason for us to ... use those things." Thyme & Again Creative Catering got rid of plastic straws almost ten years ago, after the owner felt concerned about plastic pollution on land and in the ocean. 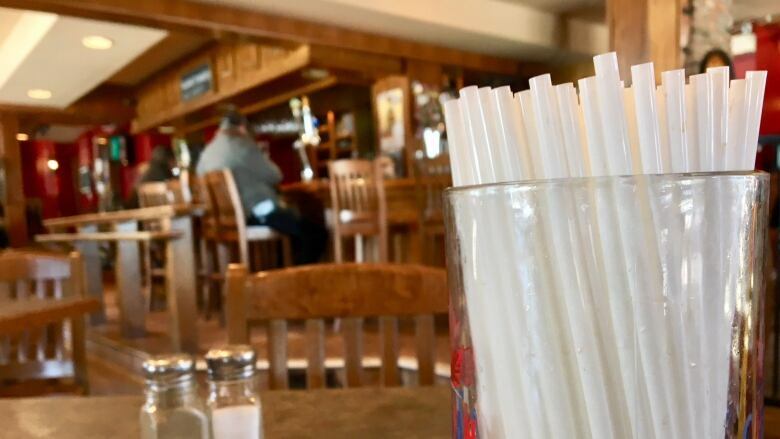 The company then switched over to paper straws three years ago, Shelia Whyte, the cafe's owner said. "The damage to the environment is unimaginable," she said. "We stepped forward early on and we just said 'no.'"